SANTA CRUZ, California -- The first video of tool use by a fish has been published in the journal Coral Reefs by Giacomo Bernardi, professor of ecology and evolutionary biology at the University of California, Santa Cruz. 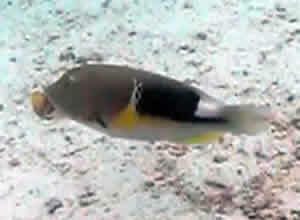 YouTube video of the wrasse using a tool. We are sooo arrogant! We think we are the only ones who have the brains or the instincts to think creatively. I am definitely not a scientist. But I do have a brain and some common sense. We ignore the possibility that the "lower" creatures have any ability and we are sooo surprised that they show certain activities planned and helpful to their existence. Shame on us. We need to recognize and accept the various skill and knowledge that many others (non-human) in this world have. Necessity is the mother of invention for all species. Again I say "Arrogance".